Something of a rammy has broken out over the scale of increases in rail fares. In fact, this year’s (average ~5.9%) are no worse than previous. But now that many are feeling the fiscal pinch, sensitivity on such inflation-busting rates has reached a fever pitch. Tempers have been frayed by this UK ConDem government continuing Labour’s policy of shifting the cost of rail funding onto passengers. In 2006, Labour funded £6.5bn; this year Cameron will provide just £4bn. What customers pay rises from £4bn to £6bn in the same period—as much by growth in ridership as increase in fares. If increases were applied sensibly, people might accept them. But some fares—including season tickets costing several thousand pounds—will increase by 11%. And this when train travel in parts of Europe costs 10% of what it does in the UK. Too many private companies got their snouts into the trough under the Tories and their profits speak for themselves. Examining my local (East Lothian) part of the network an opportunist and downright underhand fare structure has been perpetuated for another year. 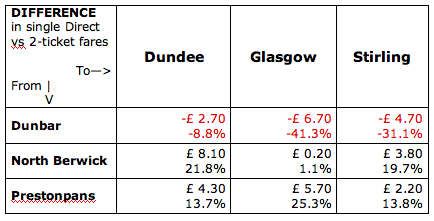 Our fares (calculated on off-peak day returns) have risen by 6.3% on average, with the worst being an 8% increase on the Dunbar-Edinburgh fare (where ScotRail doesn’t even run a regular service) to £10.80. What is especially galling for Dunbar travellers is that the NB-Edinburgh fare for a similar half-hour journey only went up by 6.56% to £6.50. What justifies the good people of Dunbar getting stonked for an extra £4.30 is a puzzle. But the sneakiest part of all is for tickets beyond Edinburgh. This matter was raised with ScotRail over a year ago—and ignored. It is uniformly cheaper to buy tickets in two parts—to Edinburgh and then beyond Edinburgh than as one through ticket. But through tickets are all that the unstaffed station machines will sell you and on-board staff refuse to sell anything but a full single fare (if you haven’t got your ticket before boarding). As shown in the table below, the penalty incurred by NOT buying two tickets averages 14.2% from North Berwick and a whopping 17.6% from Prestonpans. It is wholly bizarre that it is cheaper to travel from North Berwick than from Prestonpans, despite it being 16 miles closer to Edinburgh (2/3rds the distance). Both John Yellowlees (ScotRail Customer Service Manager) and Steve Montgomery (Managing Director) are aware of this issue but, to date, have simply waffled in answer to requests for corrective action. The calculate the two-ticket price, add the appropriate fare in the ‘Edinburgh’ column to the destination fare on the Edinburgh line. Tabulating the results gives as big a pig’s breakfast of irrational pricing as you could find in any railway buff’s nightmare. It is hard to believe that everyone at ScotRail is so innumerate as not to see the public relations disaster of such an illogical structure so the only logical conclusion is that it is a wheeze to milk extra money from their customers without their realising that they are paying up to 25% over the odds. And, before you celebrate that Dunbar’s getting a deal on direct tickets, see above where they are already getting fleeced 40% more than other ScotRail customers. Only their best deal (Dunbar-Glasgow) saves them that 40%. Suffice to say, the table highlights a whole series of anomalies. If any other vital commodity were sold with such arbitrary price structure, there would be a riot. It’s only because rail fares—like the myriad energy tariffs—are so complex that people simply give up trying to unravel it all and pay up. Which was probably the plan all along.